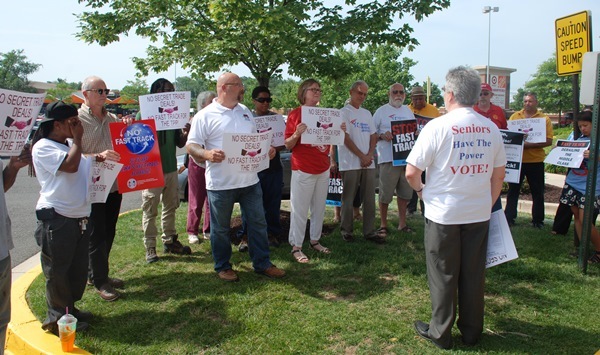 IAM members and others protest outside a regional office of U.S. Sen. Ben Cardin (D-MD) before a crucial vote on “Fast Track” Trade Promotion Authority. Cardin voted against the measure on Tuesday. The U.S. Senate narrowly approved a measure Tuesday that virtually assures a final passage of “Fast Track” Trade Promotion Authority for the Trans-Pacific Partnership (TPP) and other potential trade deals. The Fast Track legislation allows the administration to present free trade deals, such as TPP, to Congress for an up-or-down vote with no opportunity to offer amendments. Votes on the still-secret TPP and dubious aid for workers displaced by trade deals are yet to come.